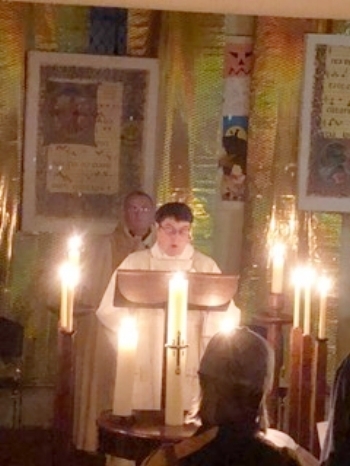 Easter Vigil at St Mary Magdalene's at 5.30 am. Sr Juliana was the deacon. Sr Juliana sings the Exultet. The Vigil was followed by a gala breakfast. Miss Daisy is freaked by the Good Friday changes in the chapel!! Good Friday at St Mary Magdalene's. The Passion of our Lord Jesus Christ, accroding to John. Sr Juliana and the Rev'd Prue O'Donovan singing a duet. The Feast of the Annunciation. This year the Sisters of the Incarnation will keep their annual festival of the Annunciation of the Blessed Virgin Mary on April 8th at St Francis of Assisi, Clarence Gardens at 5.00 pm. with Evensong followed by High Tea in the Community Centre next door. The preacher will the Rev'd Andrea McDougall, and Sr Juliana will be the officiant. The Rev'd Prue O'Donovan and Sr Juliana will sing the anthem, Songs of Praise the Angels Sang. 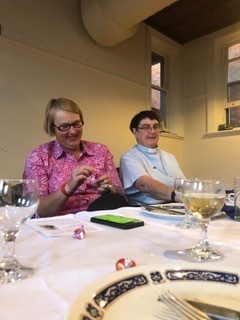 December 5th 2017 marked the 25th anniversary of the ordination of the first women to the priesthood in Australia after the passing of the General Synod Canon. Sr Juliana was one of the five. Three of the women, (pictured on the left concelebrated the Eucharist with Archbishop Geoff Smith, the present Archbishop of Adelaide, at St John's Halifax Street, with 140 friends and supporters. It was a great occasion, with beautiful music and enthusiastic singing. A fabulous supper followed afterwards. Archbishop Geoff Smith concelebrated the Eucharist with the Rev'd Joan Claring Bould, the Rev'd Susan Straub and the Rev'd Sr Juliana SI.